We are indeed the living paradox: everything and nothing. It is said that to become all, we must offer all into the Fire of the Divine; the Flames of Illumination. 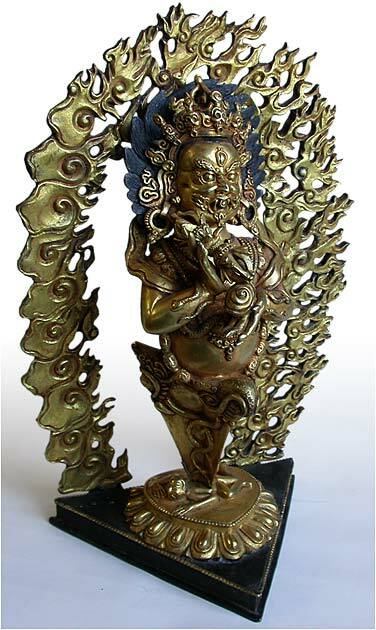 In such matters, Mahakala (the Lord of Time) the embodiment of wrathful fiery compassion is here to catalyze the soul's essential longing. 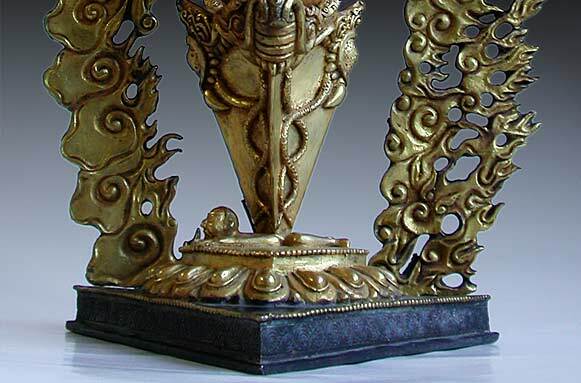 Much more than a simple statue this Tibetan bronze is a magnificent ritual implement, a dagger (phurba) used to cut away the roots of suffering attachment, ignorance, anger, dullness and fear, emanations of the ego entrapped in the illusion of samsara. The three-eyed Mahakala, protector of the doctrine is resplendently horrific, black hair flying in the fierce heat of an aureoles of flames. 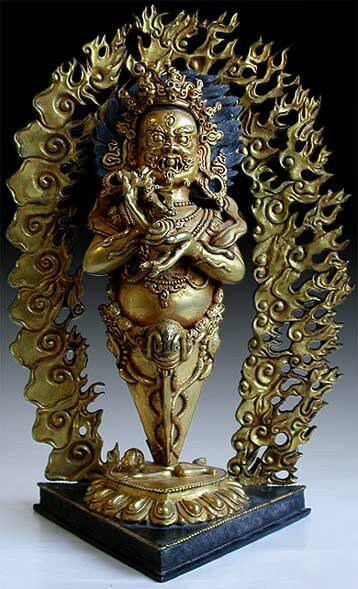 In his left hand, a skull bowl overflows with blood and guts of our own inner demons, demons that when dissolved becomes the gateways to our illuminated consciousness. 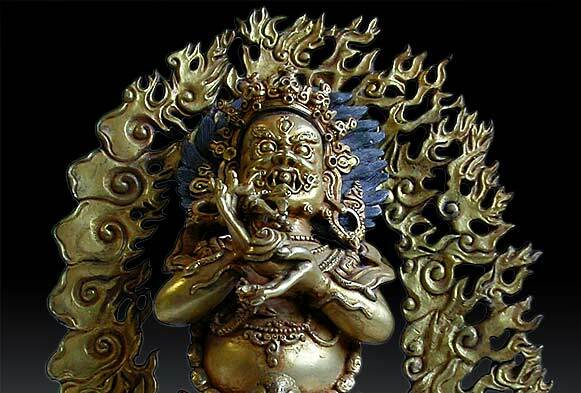 With his fangs bared, tongue curling, blood streaming from the sides of his mouth, Mahakala stands adorned with writhing snakes and garlands of freshly severed heads, crowned with five skulls representing the obstructions that he annihilates. 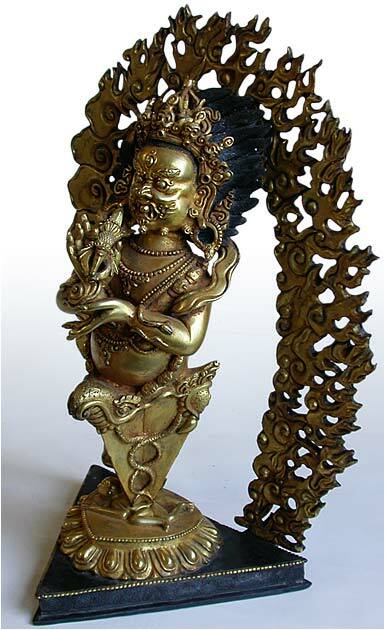 The deity's magnificent golden body crowns a three-sided ritual dagger, which pierces the core of our ignorance personified as demon. 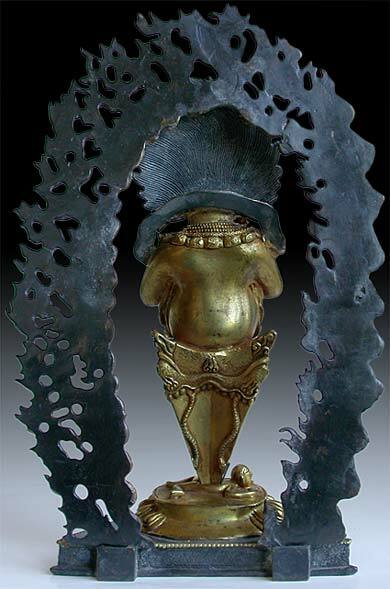 This beautifully articulated bronze is finely cast, chased and gilded, with superlative modeling of all the parts. The details are vivid, notably the texture of snake skin and the wonderful modeling of the hands, with all fingers defined and long menacing claws at the tip of each one. 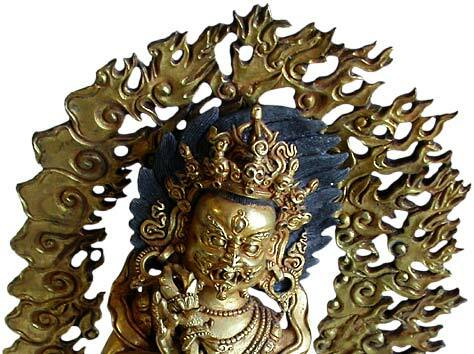 This magnificent ritual object and statue is in extraordinary condition. 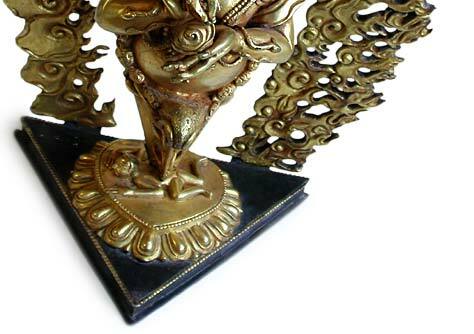 It conveys a dynamism that endows dharma in action for those who choose to enter the force and field of Mahalaka's powerful gifts of illumination.